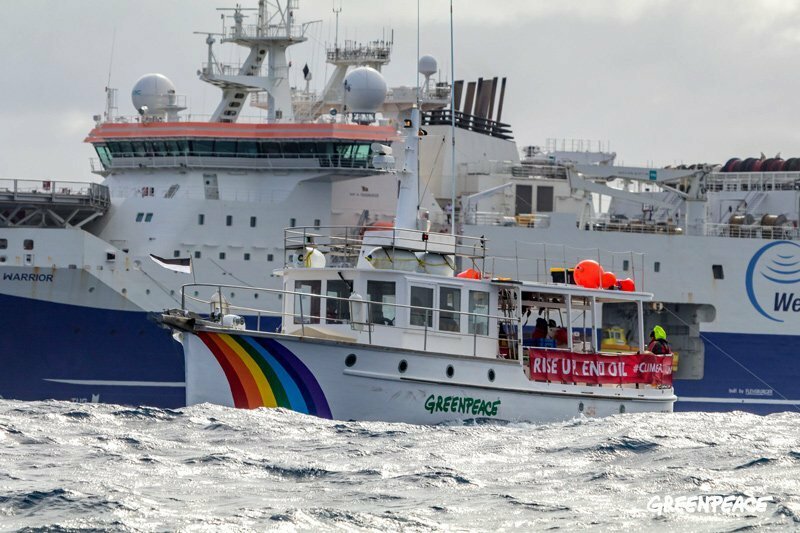 Greenpeace says its New Zealand executive director Russel Norman was among activists who jumped into the sea to try to thwart deepwater seismic testing for oil 50 nautical miles off the Wairarapa coast. Greenpeace, the ever-thoughtful employers of Mr Norman, tried hard to cover up the fact that in attempting to alter the course of the Amazon Warrior Norman breached provisions of the Crown Minerals Act. In fact, they reached out to their very best PR guru to put the best possible spin on the day’s unfortunate events. God forbid that people get the idea the ship was forced to halt operations and change course or it’s illegal to interfere, or anything like that. Greenpeace said in a statement that its swimmers had managed to force the oil exploration ship to halt its operations and deviate off course, which the group said was a breach of the so-called Anadarko amendment, an amendment to the Crown Minerals Act in 2013 that made it a criminal offence to interfere with offshore oil and gas structures and established a 500 metre non-interference zone around any structure or ship engaged in exploration. Yeah, that should do it, no probs. Oh, sure it is, definitely a climate emergency, after the temperature resolutely refused to rise for 20 years and only went up when a gigantic El Nino came along, which has now gone and the temperature is back to what it was before. The CO2 was rising faster than ever all this time. Mad pursuit of new oil, what’s that for? Well, hospital equipment, fertiliser, ambulance transport, defence of the realm, education, school picnics, police cars, tractors, pea harvesters, the morning red-eye to Wellington and fishing boats. Maybe he doesn’t like being thrown under the bus, er, ship, but he did it to himself. Clearly, Russell Norman is as mad as a hatter, as thick as a brick and doesn’t understand prosperity. * Dialogue to be imagined in the dulcet cadences of our inimitable and beloved John Clarke, may he rest in peace. I suspect that Resolute VS Greenpiss in Canada may well bankrupt them. That said if Little A can get off for what he said then maybe the bludgers might get a walk. It’s not for thee and me. I just watched One Fake News at 6 tonight. The Norman story came up, immediately followed by a BBC propaganda piece on coral bleaching in the Great Barrier Reef. What are the chances? Surely a coincidence that One Fake News would put these stories back to back? I met him at the Herald in the 70s, caught him cheerfully stealing a fag and a light from the desk of the absent editorial secretary. What a laugh. No, I see what you mean. And I always thought I was special. A rich has-been tries to lecture a little old lady. You, sir, are a playwright. I certainly did, I’ve just spent ages chuckling over these videos, thanks. Russel Norman, Greenpeace NZ executive director, Sara Howell a 25 year old Greenpeace volunteer from Wales, and Gavin Mulvay, a kite maker from Ashburton, have been charged with interfering with the oil exploration ship Amazon Warrior under the Section 101B(1)(c) of the Crown Minerals Act, known as the Anadarko Amendment. To put this into a bit of perspective, I can recall some data from my time on seismic ships. A seismic exploration vessel tows “streamers” of about 5km in length behind it, possibly multiple streamers. Each streamer is filled with kerosine, and uses a set of fins called “birds” that makes the streamer fly at a constant depth below the sea surface. A 3 D survey will gather data from many closely packed lines. Each line takes quite a distance to line up and navigate to in place. The ship is, according to him, trying to kill his kids. .No. It is simply not. The ship is trying to conduct a geological survey. He is a snowflake libtard. The aussies don’t think we are going to achieve 100% renewable energy supplies. Looks like Russell Norman and his Green followers are not going to live in a “carbon-neutral” world. Thanks. That’s an unusual link. I wasn’t paying attention at first but eventually observed that upon reaching the page, a pdf was downloaded. Worked out fine in the end, though I don’t read cyrillic. Fascinating paper; more to say on it shortly. Greenpeace and Friends of the Earth fined for breaking Electoral spending rules in 2015 UK election. Yes, the lunacy of those righteous ones appears to obscure the rules. They certainly don’t care to obey them. Just days ago they were jumping into the sea in front of a giant ship. I could scarcely believe my eyes, Andy. Poison gas, mega-drought, 12 million homeless, hot enough to melt lead (on Venus! ), turns oceans acidic, most noxious gas of all. ‘Reprehensible’ scarcely bites deeply enough for all this. Their evil pen needs a forceful shove somewhere tender. I’ve left a comment for the good professor — oops, I called him Mr. but I don’t care. I see you’ve got top billing and only up-ticks, so far. Did you have to take out a subscription before you could comment there? Yes, $12 buys six months. I was furious. Nice to get good marks (thanks for letting me know), but I don’t think I have top billing, just the most recent comment. I did a bit more research after posting that and found there’s not much of a mystery to Syria’s precipitation since 1920 so I’ll post another comment about that. Prof Cole is another warmster who just harps away on the same string. But his conclusions are evidence-free. Wonder if you’ve come across this paper by Francesca de Chatel… gives a good outline of the mismanagement of agricultural policies and water allocation in Syria leading up to the conflict period. She is very critical of the spin that has been placed on climate change/drought being responsible for Syria’s war. CO2, on the other hand, is a non-toxic gas essential for life on Earth.